THE FINAL SURPRISE ARRIVES! Here comes the countdown crazy 48 hours of Banggood’s 10th anniversary. That means you only have 48 hours to fight for your shopping list. What is the most crazy notice? Four snap up activities are already for the last day of anniversary. Begin from 10: 00-15: 59 (UTC + 8), big amount of productions with original prices of more than $ 200 are reduce to $ 99, and in the next six hours, some specials are from only 9.9 $. At 22:. 00-3.59 (UTC + 8), prices are as low as $ 0.99. In the last 6 hours, you could only pay 0.10 $ for your favorite one. From 10:00 am of Sept.8th (UTC + 8), every 2 hours have four special prices productions are on sale. And there are also attractive items from 10 $. the prices in warm-up area are lowest price effect, there are 8 products in a category. During this time, if your spending reaches $ 99, when you pay for the order it will reduce $ 10. 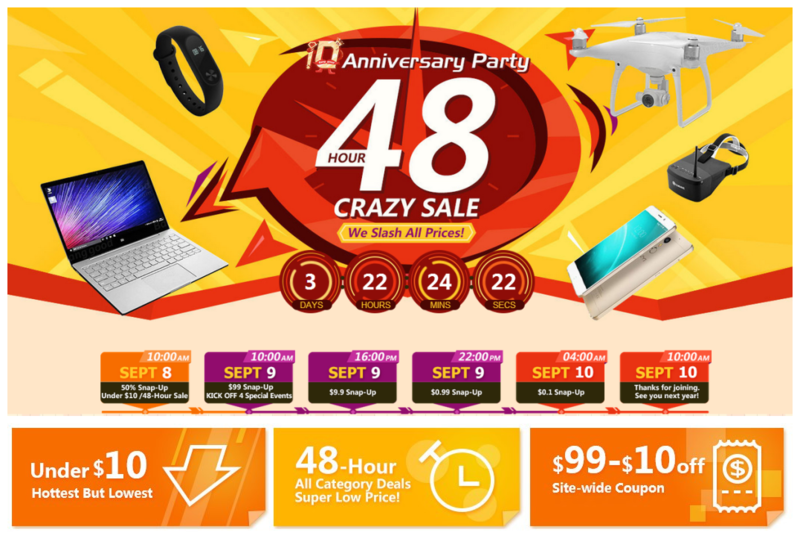 The focus appears, the last crazy hour provide the most amazing discounts for consumers at 10th anniversary party. There are three surprises, productions in Snap-Up zone are in 50% off! There is a special zone for trendy items from 10 $. Before you pay ,remember to use the coupon to cut down the prices from 99 $ to 10 $. Be sure to pay attention to the coupon, 11% of them valid in 24 hours. Full site of Banggood.com can be used. However, the coupon can be used only once, and 9:59 a.m. (UTC + 8) Beijing time Sept.8th is the deadline. The lager surprise is that there are 700 coupons are used to reduce $ 10 . In order to receive the coupon, customers need to enter the order from August 10. And per-user only can receive one. If your order is ranked first within 48 hours, you will receive a $ 500 coupon; ranked second could received $ 200 , the third will receive $ 100. Goods from outdoor and home, electronics, fashion and other categories will provide unprecedented prices. Such as, short sleeve linen dress and outdoor sport purse , soft beach sandals , and so on . Banggood won’t let you down. Come on and fill in your shopping list!